By Dr Diane Lees-Murdock CBiol MRSB, course director BSc (Hons) Biology, Ulster University and Mr Chris Murdock, DH Christie Memorial Primary School, Coleraine, N. Ireland. Year seven pupils at DH Christie Memorial Primary School have been learning about the Victorian diet and how nutrition varied between the rich and the poor. 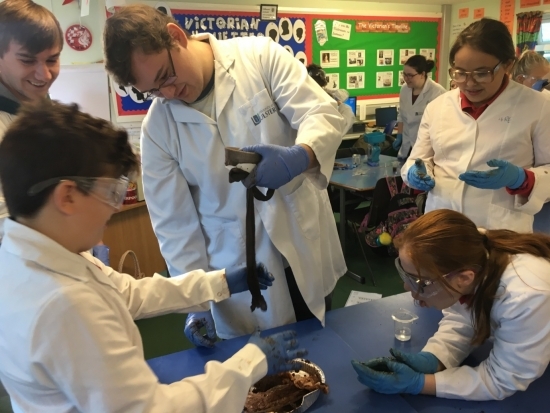 To celebrate Biology Week, students from Ulster University were invited extend the pupils’ learning with the Eggs-cellent Victorian Eggs-periment. As part of their curriculum on the Victorians, the children had been learning that while the rich ate a good diet which met their nutritional requirements, poor people had a limited choice and narrow availability of foods. They had also been learning about the nutrients in their favourite meals, in particular vitamins and minerals and how this compared with the Victorian diet. They learned what each nutrient helps their body to do and how they enable them to stay healthy. When the university students visited the school classroom, the children were then prepared to extend this knowledge further. The undergrads delivered activities using The Crunch resources from the Wellcome Trust to help the pupils find out about the digestive system, how nutrients are absorbed into our bodies and investigate what happens if we are missing an important mineral from our diet. The year seven pupils felt like ‘real scientists’ as they donned lab coats, gloves and goggles for their afternoon of experiments. 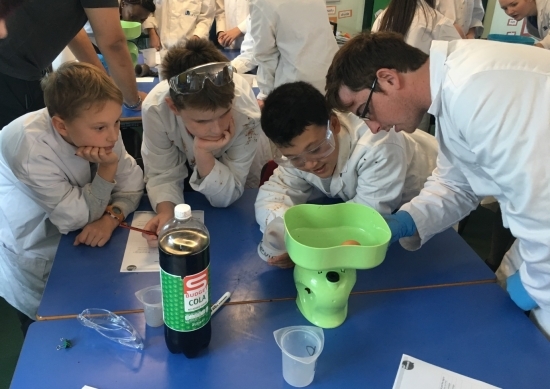 Working in small groups, university students guided pupils in a practical experiment where they recreated the digestive system in the classroom. This really piqued their interest and set the scene for further learning. Explaining that scientists sometimes use experimental models to answer scientific questions, we used the egg as a model to demonstrate what happens to bones when there is not enough calcium in our diet, as was often the case in Victorian times when rickets was prevalent. These experiments introduced the children to a range of valuable scientific skills such as controlling variables, taking measurements, using results to make predictions, reporting and presenting findings. Everyone had a great afternoon, pupils were excited about the activities and the older students enjoyed the interaction and sharing their scientific knowledge with the budding biologists. We hope that this experience will encourage the younger student’s engagement with biology and science as they progress to secondary school and hope to see some of these pupils become future scientists. We would encourage anyone thinking of getting involved with their local school to use Biology Week as an ideal opportunity to engage with young people. Read more about Biology Week 2016 and find out how your school or university could get involved next year.